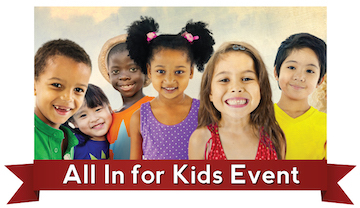 The Northshore Schools Foundation holds many smaller fundraisers throughout the year, however the largest of the year is the All in for Kids event on April 4th. As in previous years, there are two opportunities to attend this event: breakfast at 7:30am and lunch starting at 11:30am at the Evergreen Church (3429 240th St SE, Bothell, WA 98021). In the time between these two events, there is an information fair where you can learn more about the foundation, listen to kid musicians from the Northshore School District, and meet other people who support our kids. For those who don’t know about the Foundation, in addition to supporting Backpack For Kids, Girls Who Code, Northshore Music Partners, Basic Needs Aid, and the Opportunity Fund, it is in organization that provides grants to NSD to support curriculum enhancements, innovative classroom grants, and scholarships for teachers seeking National Board Teacher Certification. Over the past 12 months, the Northshore Schools Foundation has granted over $7,000 to teachers at Canyon Creek. These grants have supported, among other things, the Homework Club and Summer Story Time program, iPads for 3rd-5th graders, books for kindergarten and 1st grade take-home reading bags, and wiggle seats for 1st graders. Additionally, the foundation grants provided social/emotional books with high-interest and low reading level content, funding for a 4th grade garden, and access to online math subscriptions for 3rd graders. And finally, the 4th graders received new graphic novels, and Canyon Creek received money to purchase additional bilingual books for the library. Interested in attending the All in for Kids event? Nancy Tangen is the Canyon Creek table captain and would love to fill one (or more!) Canyon Creek tables at this event. There is no charge to attend the event, however each attendee is asked to donate $125 to the foundation. We would love to have lots of Canyon Creek support for the foundation at this phenomenal event! Please contact Nancy Tangen (nftangen@gmail.com) for more information and to reserve your spot!